The paper, developed for the Commonwealth Secretariat, London, examines, the nature of digital economy in a developing country context, focussing the study partly on Bengaluru, often called the Silicon Valley of the South. It distinguishes digital industry from the earlier software industry and then the Internet industry.The paper defines digital economy as one where data and digital intelligence are the chief economic resources, which are employed for sector wide reorganisation of economic activity. It goes beyond the information and communication related sectors like media to every economic sector, from transportation, energy and finance to agriculture and manufacturing to health and education. The paper briefly visits India's policies and programs on digital infrastructure especially on public data infrastructures that are being built. It then examines the digital industrialisation strategies of the US, China and the EU. 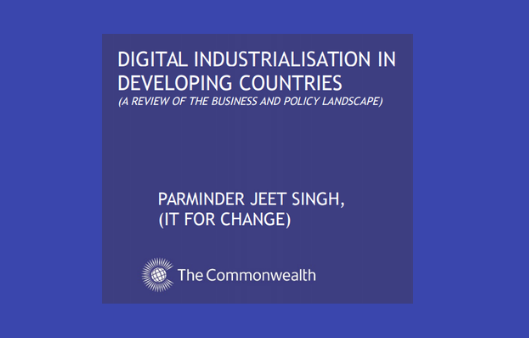 In the end, the paper offers recommendation on how developing countries must adopt a mixed economy approach to digital industrialisation, with a focus on public digital and data infrastructures. it also addresses what positions developing countries can taken at global digital trade forums.